The Subaru 50th Anniversary Editions will be unveiled at the Chicago Auto Show. Here’s what’s coming. At the Chicago Auto Show running February 10-19, Subaru of America (SOA) announced they will unveil the entire lineup of 50th Anniversary limited edition models. The 2018 Subaru Outback, Forester, Crosstrek, Impreza, Legacy, WRX, WRX STI and BRZ will all get special 50th anniversary trim and are coming this week to the Windy City. Each model will be available in the top Limited trim except Forester coming in Touring trim and also in XT trim. 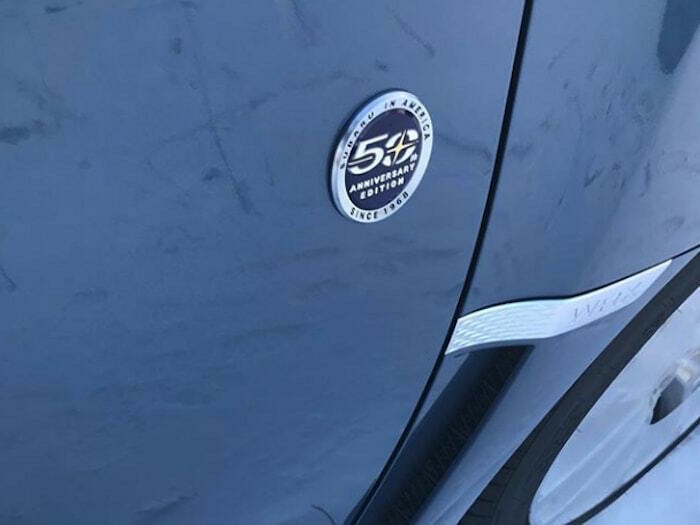 The anniversary models will come in a new “Heritage Blue” exterior color with a special 50th anniversary badge with a silver ring, gold star and the silver/blue color placed on the front fender of each model. They’ll also get special wheel finishes. Inside, each model will feature black leather upholstery, silver stitching, silver seat belts, and special embroidered logos. We found out from a Subaru source close to the brand, SOA will limit the number of each 50th anniversary edition and each model (except WRX/STI and BRZ) in the lineup will be limited to 1050 total examples. 2018 Subaru WRX, WRX STI and BRZ sport coupe will get 1050 total examples for the performance line. WRX will get 600 Limited trims, WRX STI Limited will see only 200 examples produced and BRZ will get 250 Limited models in the special 50th anniversary trim. There will be 800 2.5i Outback Limited trims, and 250 Outback 3.6R Limited trims produced. Forester will get 800 2.5i Touring trims and 250 Forester 2.0XT models. Crosstrek will get 1,050 Limited trims, Impreza gets 500 2.0i Limited sedans, and 550 2.0i Limited 5-Door hatch models. Legacy gets 800 2.5i Limited and 250 3.6R Limited trims. We also found some info on a Subaru dealer's website, the 2018 Subaru WRX STI 50th Anniversary Edition sedan will get Recaro performance seats, driver assist technology, 19” high luster dark gray alloy wheels, 50th side badge, all-weather floor mats w/50th logo w/silver stitching, velour chrome badges, and blind spot detection. It also comes with an STI short throw shifter, alloy wheel locks, rear bumper applique, blue footwell illumination kit and cargo tray as part of the limited edition package. Subaru of America has not released pricing on the 50th Anniversary Edition 2018 Outback, Forester, Crosstrek, Impreza, Legacy, WRX, WRX STI and BRZ limited edition models. We’ve heard some Subaru dealers already have some of these cars in their showrooms. Look for Subaru to unveil the 50th Anniversary cars during press days on February 8-9. Stay tuned.